Part C3: "It's a set-up! : Set-Up"
Once designed, the car is still not the complete article. The team will not stop designing and developing new parts until the final race of the season, and teams will even develop parts specifically for a particular circuit - for instance at Hockenheim in 1998, Ferrari introduced a rear wing specifically for the ultra high-speed circuit , and at the same place a few years before, some teams even tried running with no rear wing at all! So the car must be set up to fit the place where it will race, and the options on set-up tend to concentrate on the aerodynamics and the suspension. We have looked at each of these in the design phase, so what can the race engineer do to get what he wants? Looking at the aero set-up, the driver will require the car to be balanced to a certain point. He may like to drive with the centre of pressure in a certain position, which will generally be different to his team mate - the law of sod! So how does the team cope with this? Well, the two aero devices which can be changed on the car are the front and rear wings, with the rest of the aero set-up being fixed and only modifiable in the long term through wind tunnel testing. The front and rear wings provide massive downforce at each end of the car, and each one can be altered to vary the amount of force it produces. If you imagine it like a see-saw, two people of the same weight will balance it on its centrally mounted pivot. Put someone heavier on one side, and the balance point will shift, and one end will lower. It is the same idea with the front and rear wings. The complexities of aerodynamics allow the engineers to get a different force from the same wing. It has two defining measurements, the chord (the distance between the leading and the trailing edges), and the span (the width of the wing on the car), with the cross section then defining the final shape. After the design of the wing, the angle of the chord to the oncoming airflow - called the angle of attack - defines how much force it will produce. At zero angle of attack, the wing will produce downforce, because of its design to have a longer distance underneath than over the top, as explained in a previous part of the series. However, if its angle is inclined (the rear of the wing raised), it will produce more and more downforce as the angle increases, up to about fifteen degrees. Around this point (depending on wing design), the air gives up clinging to the underside, separates from the surface, and the downforce produced will decrease. By varying the angle of attack up to that point, the engineer can fine tune - or balance - the car. 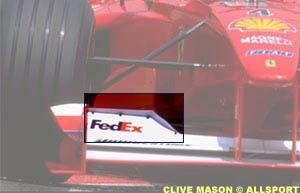 The front wing is generally made up of two parts - the main plane, and the flap. The mainplane is the part which creates the main bulk of the wing assembly�s downforce, and is at a fixed angle of attack. The fine-tuning comes not from the mainplane, but from the flap. This works in the same way as the flap which comes down on your Boeing 757 as you come in to land. The flap is still an aerofoil, and works in that manner. In travelling over the mainplane, the air loses energy and struggles to continue following the surface, but a gap left between the flap and the mainplane allows new air to come in and re-energise the flow. With this help, it can carry on working a little longer, and create more downforce as it travels over the flap. Varying amounts of downforce can be obtained by changing the flap angle, and it is the half degree �turns� of angle on this flap which are used to balance the car - it is designed to be so simple to change, it can be changed without losing time during a pit stop. At the rear of the car, teams design sets of rear wing elements - most have around three different options. These are built up of two or three aerofoils, which are fixed together, and the way this is done is how rear downforce variation is achieved. 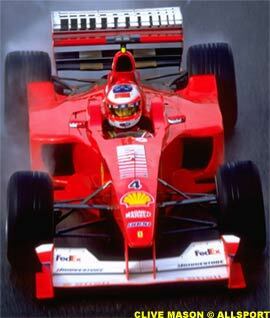 The whole element can be changed, or its angle changed, to obtain the amount of downforce required. As mentioned in the aerodynamics section of the series, an aero map will be produced in the wind tunnel, and taken to the circuit by the race engineer. This tells him the most efficient way of obtaining a certain level of downforce using the wing elements he has. If the driver wants more downforce on the rear, it shows him how best to achieve it, and then what angle of flap is required on the front wing to balance this change. It's all there on paper! The final aerodynamic change which can be made is the addition of the gurney flap. This is a small length of carbon fibre (often only 20mm high) which sits perpendicular to the surface at the rear of the flap (or wing on the rear wing set-up). Providing its height is correct, the air will flow over it, and become turbulent directly behind. This turbulence, as mentioned before, is low in pressure, and will have the effect of sucking the air out from under the wing. In doing this, the air will flow faster under the wing, and so will be at a lower pressure than normal, and the downforce produced by the wing will increase. Mechanically, the teams basically have two options. The stiffness of the springs and dampers (or torsion bars as is often the case nowadays) can be altered, or the roll bar can be changed. These, added to the aerodynamics choices, can grow into hundreds of possibilities for the engineer to explore - if the driver complains of understeer, it could be caused by incorrect aero balance, it could be that the front or rear suspension stiffness is incorrect, that the roll bars are not correctly balanced in terms of stiffness, or more often than not a combination of all these problems - it's a very complicated business! Gut feeling helps, so does an astute driver, but the biggest assistant to a race engineer is the telemetry, and as the set-up of a race car is vital to its performance, a great driver is nothing if he is not assisted by an equally great team of engineers at the racetrack. Next Week: "Passing Problems: The Overtaking Phenomenon"